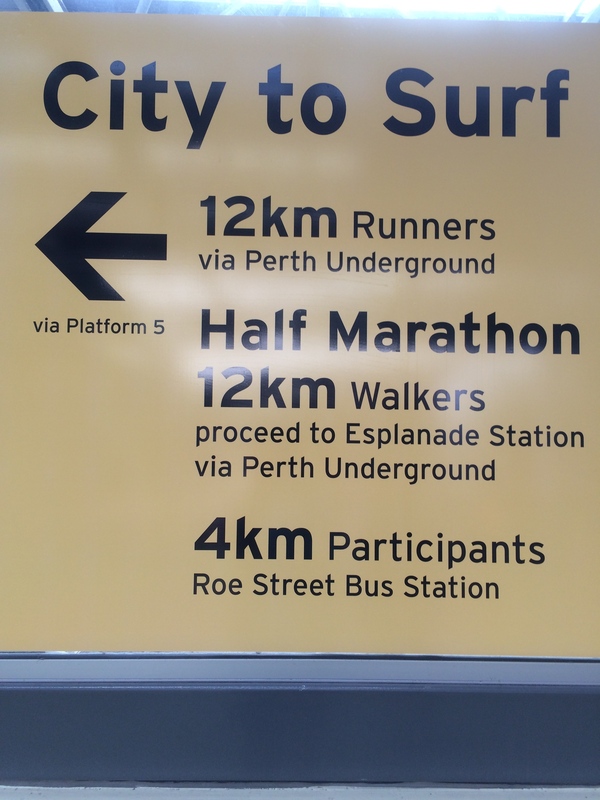 I knew that running in Perth would be different than in Kuala Lumpur but when I went to put on my running shoes yesterday for the Chevron City to Surf event, I realised just how different. I had to warm the shoes with a hairdryer as they had been outside all night and felt too damp and cold for my still tropical feet. It was nice not to have to get up pre-dawn as the race started at the very civilised hour of 9:05. Not so nice was the discovery that the possum that had been squatting in our roof space had found an alternative to the entrance we’d had blocked up and was doing its morning yoga over our heads as we headed out the door. 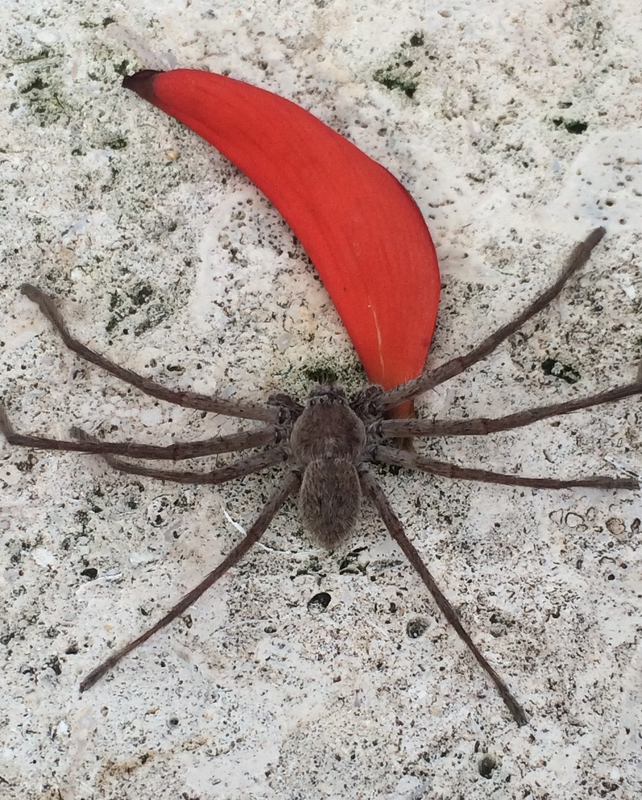 The spider – biggest I’ve ever seen outside a zoo – on the gatepost of our back gate got very upset as we disturbed its morning lie in. Thankfully, once we made it out onto the street, and left the wildlife behind, everything went smoothly. 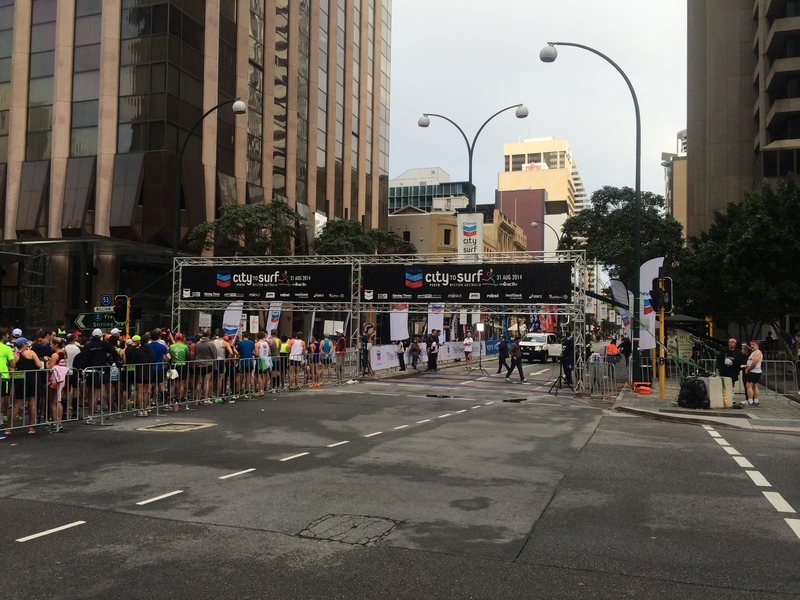 Half Marathon runners line up to start the Chevron City to Surf race. The 12km race started on the right hand side of the barrier afterwards. All very well organised! The Chevron City to Surf event which had almost 50,000 registered entrants in a Marathon, Half Marathon, 12km Run and Walk, and 4km Run and Walk, was as well organised as expected. The trains into town were free for race bib wearers. There were plenty of portaloos near the start, and signs directed participants to their correct assembly points. Despite the the fact that there were over 11,000 doing the 12km run, we found several of our friends from KL both at the start and finish lines, so the sense of camaraderie we had in KL wasn’t missing yesterday. It was great! (For the record, I saw no selfie-taking or twitter feed updating on the course but the route was tightly packed with runners so there was a lot I couldn’t see). The start line wasn’t quite as chilly as I expected thanks to the warm bodies radiating heat all around us. The 12km event was divided up into four start waves which was a smart way of avoiding chaos! The atmosphere was relaxed and pleasant, and the race started on time. This is a real community event attracting non-runners, families and people who like to wear costumes. My favourite was the guy in the hind legs of a horse, holding the head and fore legs in his hands. Running 12km in that can’t have been easy! The race went well, the route was lovely though a bit more undulating than my ITB rehab would strictly allow. Though it hurt from about 6km, my ITB didn’t get sharply sore until the last 1 km, probably because of the hills at the end and fatigue of course. My tendon is a bit annoyed with me today too, but I’m hoping that another day and it will have forgiven me my race folly. There were lots of booths with food and drinks at the finishing site in City Beach but thanks to a text telling me that my daughter had gone AWOL during the 12km walk, I couldn’t tell you much about it. I had to return to the finish line to find her. Her excuse for running off, despite having emphatically been told to stick with the adult under whose care she started, was that she wanted to impress me. Well once my anger had died down she certainly succeeded in doing that. With no training whatsoever she ran 12km in 80 mins (I did 62). 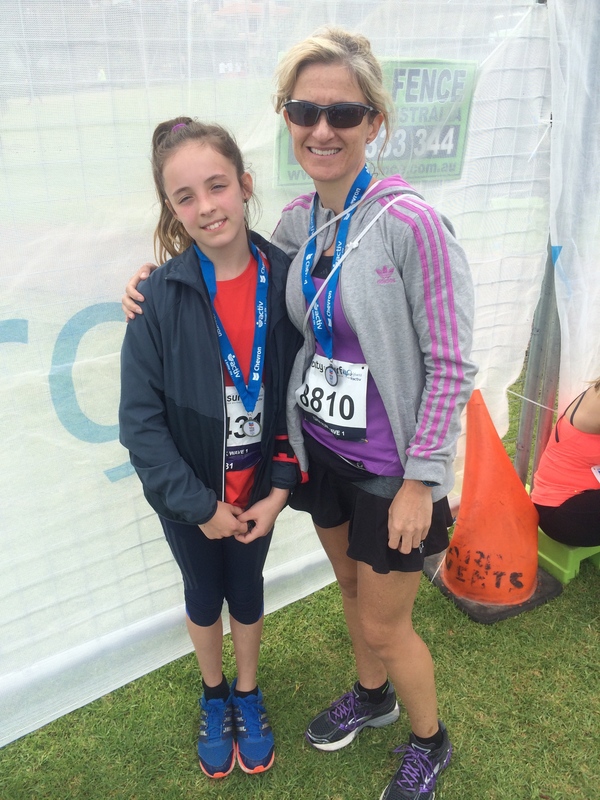 I had been worried that she mightn’t have been able for the 12km walk so the fact that she ran it faster than half the adults who signed up to run, is astounding. We ruined her imagined finish line triumph mind you as we were so upset with the fact that she’d left her group, worried and concerned for her welfare, but as she feels the tug of her overworked muscles and tendons today, I bet she’s already dreaming of her next race. She’s 11. I was 41 when I crossed my first finish line. I’ve a feeling her trajectory as a runner is going to be very different. I’m trying not to be jealous. The spider was still at the gate when we got back but the possum had presumably gone out for his Sunday walk. Maybe I’ll turn the hairdryer thing into a ritual, blowing away any critters stupid enough to enter my Brooks and get cosy. Or maybe it’s time to take the running shoes inside. Either way, I just glad to be able to wear them again and hope to participate in many Australian races in future. The fact that it sometimes might be Expat Runner & Daughter has come a something of a surprise! One of our ‘furry’ friends.